The Dusty Trail has been selected as a finalist to be exhibited at the 2010 International Quilting Association Festival/Houston in the annual IQA Fall Judged Show. The Cowpoke knows the end result of this horse round-up. 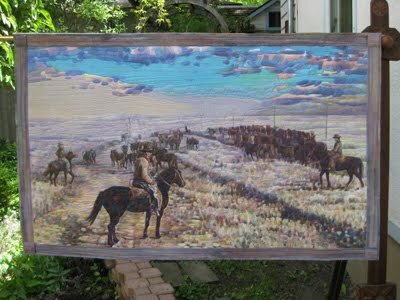 The Cowboy is Ed Peterson on his 1948 horse round-up Alberta/Saskatchewan. For creating the model of the larger bag I decided to use some of Ricky Tim’s fabric. I chose a fairly dark blue with a bit of black and his black with a slightly bluish gray dyed fabric. The larger tote is painted with a dark background. The smaller tote I want to use white cotton paint/dyed to enhance this bag. On Saturday June 19th I tested for my 3rd Dan in TaeKwonDo. It was a great day, I am so lucky to have Mr. JJ Lee in my life. Mr Lee tested six of us for 5 hours and have I learned so much from him. 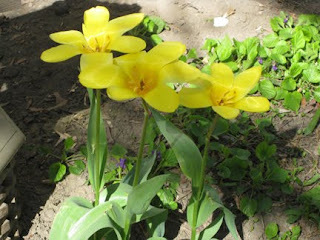 I am going to the Do Jang tonight to get started. I want to work on my running jumping frontkicks, and my sidekicks. My patterns I thought were just Ok , one-step sparring pretty good, sparring OK, breaking … well,… requires work …alot of work. I do not know whether I passed … yet I would do it all again. I was worried that I would injure myself yet I am quite good , a little sore yet whole. 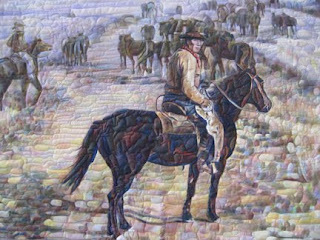 I called the quilt The Dusty Trail because when I was working on it I cried a lot. At times I even had to stop quilting so that my eyes would clear. This quilt triggered something in me, I started receiving images of my past as I worked. Time flies when you are having fun. 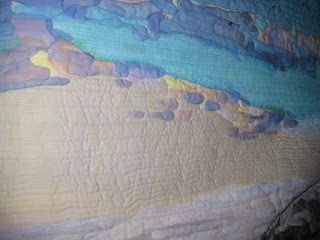 I have almost finished the quilting on The Quilt With No Name. Actually feels kind of strange. The painting was a month , the threadwork was a month and the quilting the same. I found that quilting is much more intense on the old body though especially the neck. The Quilt looks good . I talked to Jackie Haliburton of Angel Paint about all the paint that she is going to ship, great lady to talk to. It has been awhile seen I posted anything . I do not know if that makes any sense . 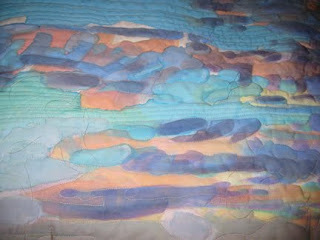 I am almost finished the quilting of the sky . 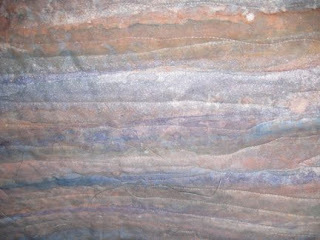 Yet there is light at the end of the tunnel and I am going to quilt today ya!!! The wind is blowing and it is cool outside actually quite a switch from Vernon. All Images and Content Copyright 2019	TyDerw Art. No unauthorized reproduction is permitted.